NASA's engineers may spend their days designing parts for spacecrafts, but once a year, they get a chance to break out of geek and unleash their creativity. Think Pimp My Pumpkin — by some of the best scientific brains in the business. The competition is fierce. After weeks of planning, designing and dreaming, they're given one hour to create their pumpkin extravaganzas. Then the struggle for creative supremacy begins. Loud music. Flashing lights. Battling spaceships, animated moon discoveries, ET on his flying bike, Cookie Monster and Manuel of Disney's Coco playing guitar. Mike Meacham is a mechanical engineer section manager at JPL. But more importantly, he is a 2017 third-place finisher. 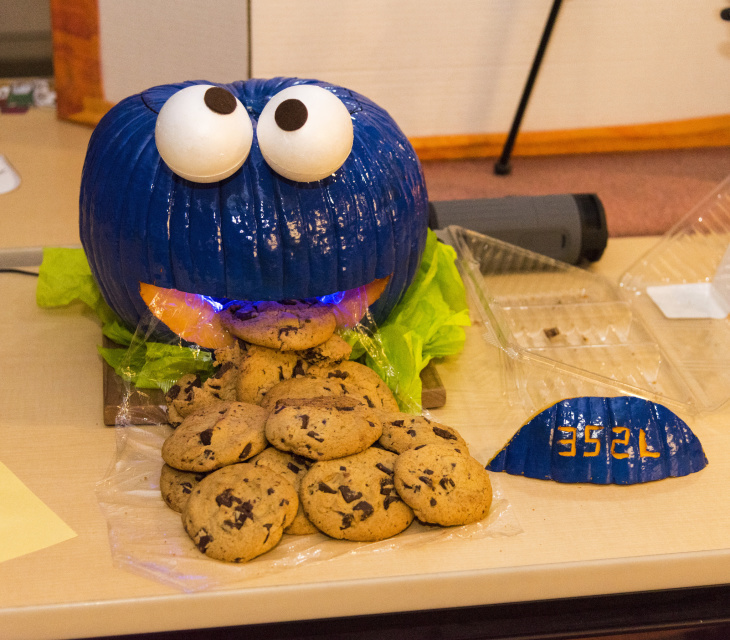 His team's pumpkin last year was a Frankenstein face suspended in air by a parachute and an air blower. This year he tried to top that with a pair of battle-bot pumpkins, equipped with wheels and swords. He paused a battle to explain just how fierce the competition is: "It just keeps getting more intense. Everyone just keeps trying to one-up the winner from the previous year so it's kind of getting crazy at this point. People's displays are so big and elaborate, you can tell people put months into it." 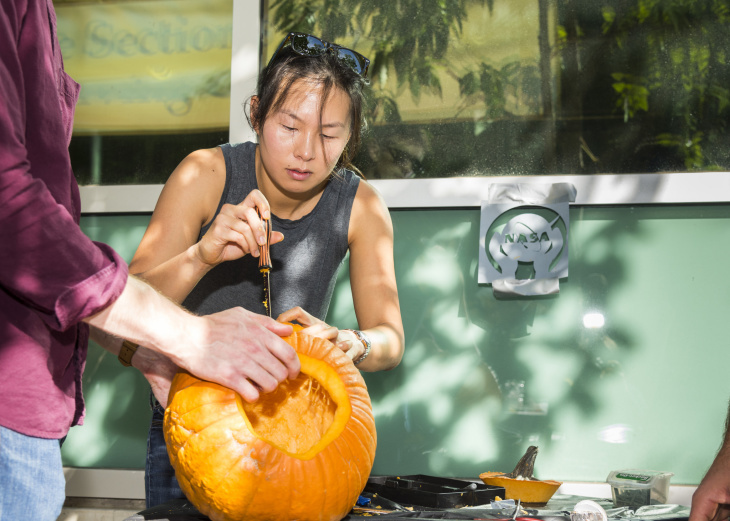 Matthew Orzewalla explained the mechanics behind his team's pumpkin. Looks cute, right? Don't be deceived. This is NASA, after all. "This is our shock initiator. 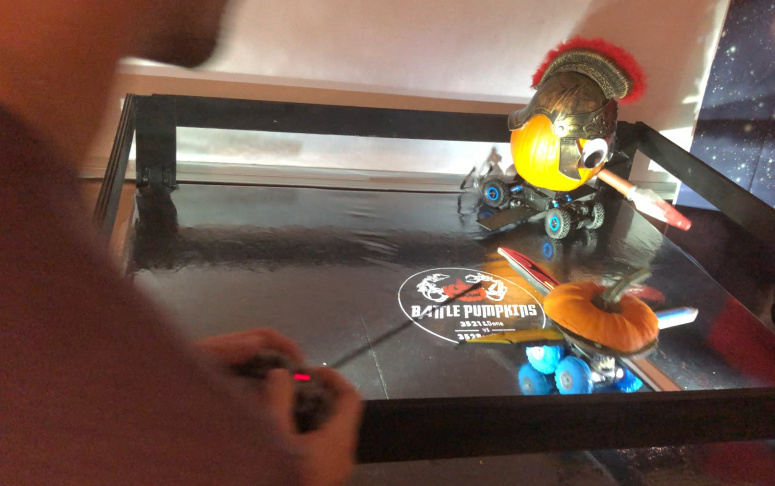 Behind the pumpkin, we've got an Arduino Nano attached to an accelerometer, and we're plotting this using an open source software called Octave," he said. For us normal folk: All those fancy things basically let the user hit the pumpkin, and then the acceleration that's caused by that blow is shown on the computer. Doesn't seem like a big deal, but it mimics a simulator that's used to test the impact made when a Mars rover detaches from its spacecraft. That's not the only reference to the work of a mechanical engineer. This satellite depicts all the paperwork that comes along with sending something into space. Several other displays were inspired by the recent news that Jupiter's moon Europa might show evidence that life once lived there. This one predicts what would happen upon our arrival on Europa: a battle between a human spaceship and an alien one. This Europa depicted life popping up from beneath the surface with a calculator at the top that ticked up with each "discovery." 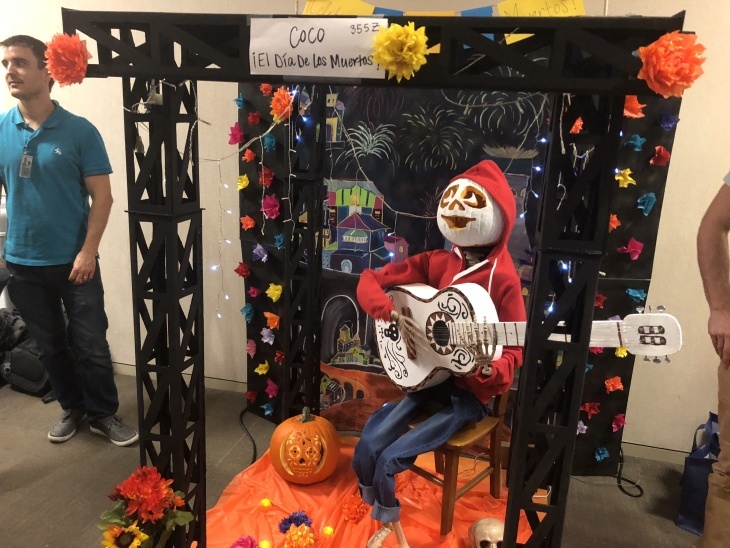 One Dia de los Muertos scene was inspired by the animated movie Coco. The skeleton's arm moved up and down, as if strumming the guitar on its lap. Other honorable mentions include a "Bank'sy ATM" that shredded cash like the famous artist's painting, a tribute to Charlie Brown's perennial struggle to receive anything other than a rock on Halloween, and this one: a hand polishing the cannonball (that's a turn of phrase, by the way). Voting for the competition lasted all afternoon. 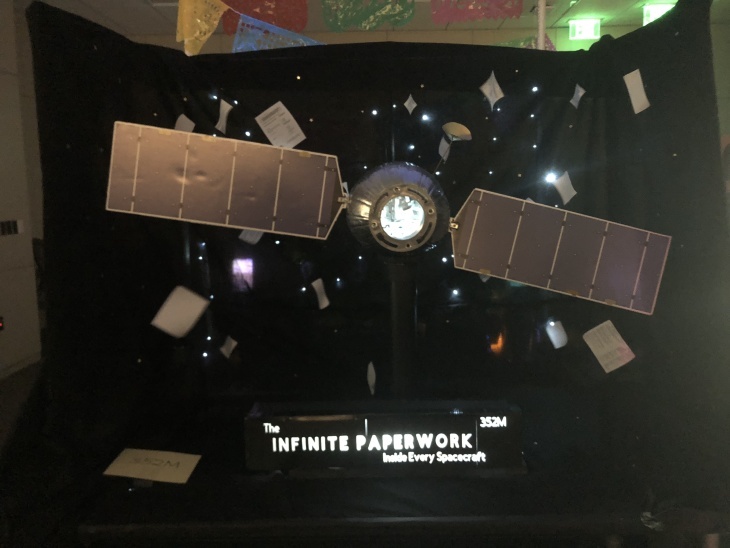 There were two entries that claimed the prize this year: the scene from Coco, and the "Infinite Paperwork" Satellite. The prize the rocket scientists get for winning? A yearlong supply of bragging rights. This story was updated on Tuesday, Oct. 30, 2018 at 5:52 p.m.